For the fourth year in a row, anti-war activists protested outside the annual Boeing shareholders meeting in Chicago yesterday. For the first time this year, Boeing shareholders who oppose weapons sales to Israel have presented a resolution calling for the corporation to prepare a report detailing these arms sales. Boeing fought to have the resolution disallowed from the meeting. But they not only lost that fight, but with over 5% of the shareholders voting for the resolution, it will be brought up again next year to likely even greater support. 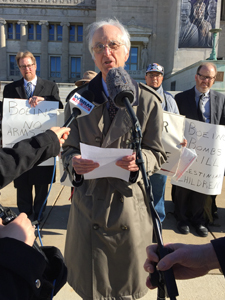 Why is there opposition to Chicago-based Boeing selling weapons to Israel? How is it different than any other country they sell weapons to? Boeing has been a target of the global movement to Boycott, Divest, and Sanction (BDS) Israel for many years as its weapons were used in Israel’s military attack against the Gaza Strip in 2008-09, during which 1,300 Palestinians were killed, and again in 2014 when over 2,200 were killed. In both cases, the majority killed were civilians. Boeing produces the Hellfire missile, AH-64 Apache attack helicopters, and laser guided one ton “smart” bombs used in these attacks. Israel’s actions have been condemned by multiple international NGOs and humanitarian organizations, such as Amnesty International and Human Rights Watch. weapons sales to Israel and 24 doctors and scientists published an open letter in a renowned medical journal stating, “In the aggression of Gaza by Israel…we witnessed targeted weaponry used indiscriminately and on children and we constantly see that so called intelligent weapons fail to be precise, unless they are deliberately used to destroy innocent lives.” Protests were also held outside of the Boeing stockholders meeting in Chicago that year. Seven major universities in the United States have passed divestment resolutions that included Boeing due to the company’s ongoing arms sales to Israel. RESOLVED: Shareholders request that, within six months of the annual meeting, the Board of Directors provide a comprehensive report, at reasonable cost and omitting proprietary and classified information, of Boeing’s sales of weapons related products and services to Israel. 1. Processes used to determine and promote sales to Israel. 2. Procedures used to negotiate arms sales to Israel, government-to-government and direct commercial sales and the percentage of sales for each category. 3. Disclosure of sales and other arrangements with local security forces. 4. Categories of military equipment or components with as much statistical information as permissible such as contracts for servicing/maintaining equipment. 5. Detailed risk analysis surrounding business relations with countries, like Israel, that have been accused of violating Geneva and Hague conventions and international human rights law. The focus of the shareholder proposal is not to prohibit Boeing selling products to Israel, but to bring the process out in the open. According to the AWC, most people have no idea that Boeing is a major weapons contractor. “If the public knew how many weapons were being provided to the Israeli military for its wars on Gaza, opposition to the weapons sales would grow,” said Kait McIntyre of AWC. The Boeing Board of Directors argued against acceptance of this proposal. We recognize particular sales may be controversial to a small number of individual shareholders. However singling out one particular customer for detailed disclosures would serve no purpose other than to allow those shareholders to second guess these important decisions to the detriment of long term shareholder value. The Board of Directors failed to respond to the reasons “one particular customer” would be singled out and how these sales can put the company at financial risk due to the impact of the BDS movement. Soon when the vote would be taken, the Board would find out that it was more than “a small number of individual shareholders” who were concerned. Israel recently completed their largest arms deal with the U.S., to purchase almost $2 billion in ordnance. Boeing manufactures the largest components of the bombs and missiles, including the guidance systems that turn regular bombs into “smart bombs.” A report by Amnesty International showed that the bombings which caused the most casualties in Gaza came from Boeing’s laser guided, one-ton bombs, the MK-84/GBU-31. Israel is purchasing 10,000 of these smart bomb kits. With the current struggle between the US government and Israel over finalizing a ten year military aid deal, there is much more attention directed at the large sums of money being paid to Israel when budgets for public education, housing, social services, infrastructure and healthcare are being cut in states across the country. This is especially true in Illinois where education and social services funding has been cut due to the budget impasse. Democracy Now recently reported on the latest negotiations with Israel in this way. The Obama administration has proposed an unprecedented military funding package to Israel that could top $40 billion over 10 years. It is the largest military funding package the U.S. has ever offered to any nation. Israeli officials are reportedly demanding even more funding. The U.S. currently gives Israel $3 billion a year in military funding under a deal slated to expire in 2018.
movement questioning US spending on military aid to Israel especially as these weapons are used by the Israeli Defense Forces to enforce a military occupation and to kill Palestinian civilians. Sarah Simmons, an AWC member, also described the increased focus the actions of the government of Israel are getting in the media and among human rights activists. The actions of the Israeli government are coming under increased scrutiny. Several major universities and investment firms have divested from companies profiting from the occupation. The human rights of Palestinians have become a topic in the presidential campaign. In the past several years, members of the AWC purchased shares in the Boeing Company in order to bring a resolution before the stockholders. 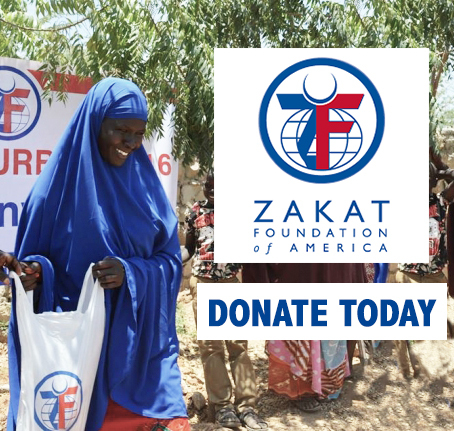 They joined together with the Interfaith Council on Corporate Responsibility (ICCR). Sister Gwen Farry of ICCR and the 8th Day Center for Justice spoke in favor of the resolution during the company meeting. 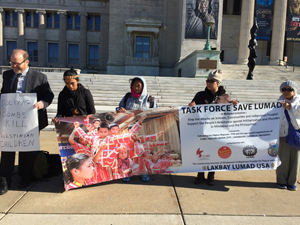 At today’s board meeting, AWC was also joined by a group of indigenous Lumad activists from the Philippines. In their traditional lands on the island of Mindanao, the Lumad people have also been victimized by the U.S. “war on terror.” Boeing produces drones called Scan Eagles which have been used in targeted assassinations there. When the votes were counted, the Board of Directors reported that 5% of their stockholders voted in favor of the resolution. The directors had stated that 88% of the stockholders had cast votes. 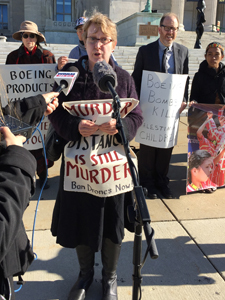 The AWC and their supporters will once again be back at the Boeing shareholders meeting next year as a part of the national movement protesting US weapons to Israel. Next articleWhy Do We Mourn the Loss of Musicians? Curious how no one ever complains about Palestinians murdering Israeli civilians.